Posted by WorldbyStorm in Media and Journalism, Sinn Féin, Uncategorized, US Politics. Reading today that deposits in Irish banks up €100,000 are to be guaranteed by the state until 2010 was interesting. This raises the limit from a miserly €20,000 (I jest when I use the word ‘miserly’). I’m not in that bracket, nor am I likely to be, and I’d hazard a guess neither are most of us reading this or indeed most of the population of this island, the one next door and the continents to the west and east, but it struck me that what I mentioned yesterday that distance between us and them – as it were – appears to have shortened radically in mere days. Of course the real nightmare is if these wonderful assurances and guarantees become the equivalent of smoke if the crisis deepens yet further and expands to encompass other areas of the global economy. …called on the Minister for Finance to outline what quid pro quo he has secured from the banking sector. I’d like to know too. And I think that they’re taking both a more progressive and useful line than Eamon Gilmore who seems stuck in discourse about ‘tax-payers’. Indeed SF’s contribution recalls something Matt Miller of Left, Right & Centre on NPR suggested at the weekend. I’m really beginning to warm to Miller, I really am, crazy progressive centrist that he is, for he argued that in addition to the $700 billion bail out package it would eminently suitable for the financial sectors to cough up, in part or all, with the government funding for universal health insurance in the US. Because here is the thing. Put to one side the argument about privatised profits and socialised costs and consider that all this is being played out at a level above (albeit coming dangerously close) our heads and with no quid pro quo. “Maintaining international confidence in the Irish banking system is a priority however today must be a line in the sand of reckless practices in the Irish financial sector and a new day of responsible banking must begin,” said Sinn Féin finance spokesman Arthur Morgan. But with responsibility comes costs. For too long general populations have had to stand on the margins as financial markets have wreaked their very special brand of magic. The chorus from them and their cheerleaders in politics and the media has been that they are impervious to interventions, that such interventions are morally suspect and that all would be well if we just left well alone. We’ve seen that particular theory crash in the past Summer. So perhaps – for once – those of us who haven’t got investments have the right to ask those who have made much of it, what’s in it for us? No blank cheques? Absolutely, unless the society gets something back. Posted by Garibaldy in Irish History, Irish Politics, Northern Ireland, The Left, The North. Northern nationalists love outlandish comparisons about their suffering, a phenomenon described by Liam Kennedy as MOPE – the Most Oppressed People Ever. Particular favorites are Northern Ireland was just like South Africa, and Northern Ireland was like Nazi Germany. While the South African comparison has at least the benefit of the South African Minister for Justice saying he would swap his repressive legislation for one clause of the Northern Ireland Special Powers Act (as well as the fact that Northern Ireland sees a form of religious apartheid unfortunately willingly practised in education and housing), the comparison with Nazi Germany is nothing short of sickening and offensive. Yet, (in)famously, it can be found in very influential circles. Father Alec Reid is a highly respected west Belfast Redemptorist priest, who has for decades been an influential facilitator of dialogue, and who undoubtedly played a key role in securing an end to the Provisional campaign. He encouraged early talks between Adams and John Hume, and was one of the independent witnesses to Provo decommissioning. There are also harrowing photographs of him administering the last rites to the two corporals murdered at the funeral of one of Michael Stone’s victims. Clearly an intelligent and compassionate man. And yet, during an angry debate at a public meeting in a Presbyterian church (of all places), he claimed that the treatment of Catholics in Northern Ireland was like the treatment of Jews by the Nazis. In fairness to him, he apologised. This came not long after the elected President of the Irish Republic, Mary Mc Aleese, a northern nationalist herself, disgracefully stated during an interview for the 60th anniversary of the liberation of Auschwitz that Protestants had raised their children to hate Catholics just as Nazis had raised theirs to hate the Jews. Details of both stories can be found here. She also apologised. While the storms of controversy caused by these remarks means that politicians would be careful about repeating them openly, such ideas are deeply embedded in nationalist perceptions of unionists, as the repeated characterisation of the Orange Order as being the same as the Nazis or the Ku Klux Klan demonstrates. The lesson we should draw then, is that while discrimination against Northern Catholics was very real, it should be kept in its proper perspective, and comparisons should be made carefully. While flicking through the current (September/October 2008) edition of History Ireland, I noticed that Simon Prince, an historian at Oxford University, was comparing the situation in pre-1969 Northern Ireland to that of post-war West Germany. Prince recently caused controversy by claiming that Derry’s Catholics had no need to take to the streets in 1968 to get jobs a houses. A claim repeated in his History Ireland article. What, then, of his German comparison? Using the French sociologist Raymond Aron’s concept of post-war western Europe being characterised by ‘dominant party systems’, he compares Northern Ireland to West Germany. Aron argued that in dominant party systems, opposition parties existed, and ‘intellectual and personal freedoms’ were respected, but that there was no possibility of the government in power being replaced. By 1968, Prince points out, in west Germany, the Christian Democrats had been locked in power since the foundation of the state by a permanent majority of voters, just like the Unionist Party in Northern Ireland. The West German police, Prince points out, were more aggressive towards dissent than the RUC, and the state restricted political activity due to the threat from the rival partitioned state and its supporters, just like in Northern Ireland. He points out that to its enemies, West Germany was the CDU state, just as Northern Ireland was the Orange State in the eyes of its opponents. 1968 in Northern Ireland, he is suggesting, was fundamentally like 1968 in West Germany. Where to start? Certainly Aron had hit on something. If we look at Scandanavia, west Germany, even France initially, we can see something of the dominant party system in the aftermath of the Second World War. However, not a single one of those states -even west Germany – had been explicitly created with the specific and open intention of forming a permanent political majority behind one party in the way that Northern Ireland had been, in the aftermath of the First World War and not the Second. Alarm bells should be ringing. Prince is mistaking a post-Second World War consensus among the populations of certain countries with broadly keynsian economic policies and welfare states for the carving out and awarding of territory to a political/ethnic group. In addition, there is the question of discrimination. I am sure that people who actively opposed to the dominant political party in western Europe – especially Communists – had difficulty in securing government jobs, and were subject to harassment. However, there is no suggestion that they were subjected to gerrymandering, discriminatory franchise qualifications, and kept out of houses to protect the majority of the ruling parties. All things which characterised the Stormont regime at a central and local level. Looked at more closely, the comparison Prince draws is facile at best. The glaring gap in this comparison of course is with the rest of the UK. Northern Ireland was a devolved administration within a state, not an independent state of its own. Its citizens did not enjoy the same rights as did their co-citizens (or subjects if we wish to be strictly accurate) in the rest of the UK, especially in the local government franchise. Surely rather than comparing Northern Ireland to West Germany it makes more sense to compare it to West Lothian? We ought to examine the work of historians in comparison too. Prince’s work seems to belong in a tradition of conservative historiography that argues that revolutionary agitation actually prevents reform, leading only to chaos and violence. Irish history should be looked at in comparison to other countries. It helps us to understand better our own history. But maybe we should have a moratorium on comparisons with Germany, during the Nazi period and after. Hmmm… this evening was almost a reprise, albeit an expanded one of last night. Watching George Osborne talking about the ‘cupboard being bare’ this evening, got to say, I’m not convinced. His ‘solutions’ seemed anodyne, penny-pinching and completely out of whack with the times. They must be cursing the timing of this Conference in this week and this month. A two year freeze in council taxes just seems… well, nothing much really in the face of five – count ’em – five bank nationalisations in Europe today. Like, this is big stuff, and they’re posturing at the sides. In a way the votes in Washington are of a different order. There it seems to me that above and beyond the visceral fear evident amongst Republicans facing re-election (and note that Democrats seemed more sanguine about their chances as evinced by the voting pattern) and having to explain intervention using tax payers money are simply unable to understand what is happening here and are still buoyed up by rhetoric about the efficacy of the free-markets, or even worse the macho bluster about how the bad should go to the wall. Even more interesting is the cant about it being Wall Street, not Main Street, that is hurting. Well, yes, but even a limited appraisal of the situation demonstrates that the links in the chain between Wall Street and Main Street are rather shorter than might be imagined. And that is as true this side of the Atlantic as the other. Posted by WorldbyStorm in Irish Left Online Document Archive, Irish Republican Socialist Party. A document from the Irish Republican Socialist Party which I won’t say too much about because I hope to have a bit more information from the person who donated it. 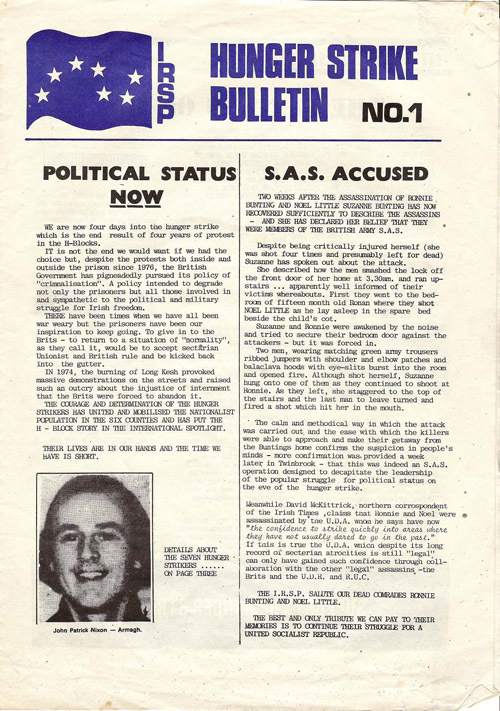 Suffice it to say that this was issued by the IRSP in 1980 shortly after the assassination of Ronnie Bunting by the UDA. Bunting was in some respects an intriguing figure, son of Ronald Bunting, follower of Paisley, he was a former member of the OIRA and later INLA member. As significant is the concentration on the first wave of hunger strikes that year, where one member of the INLA, John Nixon participated. He is, given first place in this document although it gives equal space to the PIRA members on hunger strike. In some respects there is a remarkable lack of ideology for a document – even in the context of its subject matter – issued by a left wing party and the linkage to the 19th century hunger strikes would appear to link into a different discourse entirely. Posted by WorldbyStorm in British Politics. FOR many people their first contact with Militant has taken the disconcerting turn of hearing an audience groan as someone with a fake Liverpool accent and curious hand movements stands up and demands the nationalisation of the country’s 253 leading monopolies. When the political novice is then told that the strange figure is a Trotskyist, she is understandably confused, all the more so if she is familiar with any of Trotsky’s works. How do hand gestures, however elaborate, transform a series of reformist demands into such a fearful revolutionary perspective? Well indeed. But perhaps Militant were at least partially onto something when we see governments in 2008 forced to nationalise financial institutions. And what’s stunning to see is how what was once beyond the pale in political terms is suddenly normalised as if overnight. Wait… it is overnight. Where the US leads others follow. Incidentally intriguing to hear the Conservatives whine about this turn of events. Shadow chancellor George Osborne expressed concern that if B&B was nationalised, the taxpayer would be taking on a “huge risk”. “This choice between either a private sale, which is obviously the thing you most want to arrange, or nationalisation where the taxpayer bears the full cost is not a great range of options. “There should be a third option which is a Bank of England-led reconstruction where, in the end, the large institutional creditors to the bank bear the risk, not the taxpayer,” he told Sky News’s Sunday Live programme. So let’s get this straight. The private sale is the one you ‘most want’. But there should be a ‘third option’. Er why George? To mask the actuality of what is happening behind a farrago of further financial doublespeak whereby taxpayers still wind up carrying at least some of the can? And while no fan of the Prime Minister I thought that in comparison to his supposed successor he presented – for all his obvious failings – a rather more substantial figure than the one who pottered around the stage this weekend. So, what about the other 253 monopolies Gordon, or even some of them? That’ll be the day. Posted by WorldbyStorm in US Politics. The consensus is in, the candidates drew although McCain shaded it slightly. Interesting since although the nominal topic was international issues the economy – as would be predicted – dominated proceedings. I thought that McCain came across as more discursive, Obama as more snappy. What did come through – and this may be of more benefit to McCain, is that he seemed to actually enjoy the cut and thrust and relish to the opportunity to spar. That they shared jokes (or at least chuckles) sat oddly with Obama’s more considered approach. So, if it is a draw, then in whose favour was it? I’d say McCain, but he’s had such a terrible terrible week – not the least of it being his off again on again campaign – that that surely should see some real damage wreaked on his already soft polling numbers. Can we wait for the Vice-Presidential debate? We cannot! Still, for a view on how some see these matters consider the following very distasteful image and piece from supposed Hillary Clinton supporters (and hold on a second, I’m pretty agnostic about Obama and I’d have slightly been more in favour of her as nominee until the slow motion disintegration of her campaign during the primaries – much of it self-inflicted). I’m usually immune to much of Freud’s musings, but in this case it’s hard reading that site and seeing the curious concentration on personality to the exclusion of all else not to wonder about the motive forces at work. Sure, an undigested and undisguised hostility to Obama, but what else? What else? Now, perhaps this is petty, but I couldn’t suppress the urge to smile when I heard the news yesterday that Minister of State John McGuinness had been, as it were, hoist by his own petard. And no better man for that to happen to. …jobs needed to be cut across the civil service and State sector. In an address to the Beverage Council of Ireland’s annual conference last Friday he described the public service as “now so protected by its unions that it has largely become a reactionary, inert mass at the centre of our economy”. Eoin Ronayne, CPSU deputy general secretary, said the comments were “rich coming from a triple-jobber holding what some see as questionable junior ministerial posts”. And a small problem for his analysis? …he had 10 staff employed in his private and constituency offices. But as ever it is the laziness of all this that really gets me. McGunness clearly couldn’t even be arsed to check out whether he himself, y’know (just to be clear I use that term in the Tony Blair sense i.e. entirely sarcastically), might just be open to attack on this front. No, better by far to opine at length and offensively about a topic which he ‘knows’ about in much the same way as Dev ‘knew’ the opinion of the Irish people by looking into his own heart. And isn’t it telling that such ‘knowledge’ and ideas proliferate in our society in a way that is arguably highly destructive to the society? That someone like McGuinness should effectively attempt to run with the hare and hunt with the hounds on this issue is risible. It is near irrelevant that the government began to back away from his comments in recent days as the obvious became clear – that they simply could not stand over what he was saying on any level. What it does do is demonstrate a conceptual bankruptcy at the heart of our politics on such issues where glib and unfounded attacks can be made from within government with no fear of sanction, where basic concepts such as the public good and the importance of civil service are there simply to be used for political gain. That his comments come at a time when the pretensions of the market have been demonstrated to many far beyond the left to be without substance is unfortunate for him. Good. Posted by WorldbyStorm in Culture, Northern Ireland, The North. I’ve been thinking about political language for some time now. Certainly since I read Fionnuala O’Connor’s piece in the Irish Time some while back on the use of terminology in the North. Or is it Northern Ireland? She makes some valid points on foot of complaints by Jim Allister, formerly of the DUP, amongst others that a Regional Development strategy document was ‘republican speak’. Though it was going a bit far to call it “malevolent,” surely. Writing “the North” rather than “Northern Ireland” and “Derry” instead of “Londonderry” – a demonstration of evil intent? After all, like such other august institutions as BBC Northern Ireland, this newspaper has been shuffling the terms for years. I write to convey my disapproval of aspects of the above documents. In particular I object to the import into these documents of republican speak for our country, Northern Ireland. The constant references to somewhere called “the North” is a calculated slight upon both the name and constitutional entity and integrity of Northern Ireland. It is wholly inappropriate that planning documents have become vehicles for promoting this republican agenda. Hence, it is offensive and wrong to so politicise a planning document that it has chapters headed “The Spatial Development Strategy for the North” and “the Rural Area of the North of Ireland”. Likewise the text is riddled with such inaccurate and political language. In similar vein the second city of Northern Ireland, Londonderry is constantly referred to as “Derry”, which is not its name. I also raised issues about the disproportionate emphasis on spatial planning development links with the Republic of Ireland and the paucity of focus on vital east/west links. At the same time I wrote to every Unionist member of the Executive asking how and why they permitted such to happen. Now, it seems Murphy hoodwinked his colleagues and surreptitiously inserted his republican propaganda. This demonstrates the bad faith with which republicans misuse their government office. • and a learning by Unionists of this further lesson in the unworkability of mandatory coalition and the untrustworthiness of Sinn Fein. Let’s put aside the near pathological use of language within the letter with references to ‘grubby’ which surely would have Freud working overtime and let’s consider this remarkable insight into how narrow a certain viewpoint can be. Firstly all language is political (and this aspect of his complaint in a way reminds me of how some on the Irish left blindly ignored British state power when critiquing Republicanism as if the latter somehow existed in splendid isolation from its environment). Allister’s “grubby republican speak” is the everyday usage of constitutional nationalists. To both communities, denial of their preferred term for the place they live in is disrespect, an indicator that “the other” would still oppress them if they could. Many unionists hear “the north of Ireland” as denial of their existence. Many nationalists hear denial of theirs when Northern Ireland is termed “this country”. Unionists who jeered at the self-consciousness with which the original deputy first minister Séamus Mallon occasionally mentioned “Northern Ireland” find it impossible to say “the North” and can not see that it might be sensitive to alternate the terms. It’s semiotics 101, isn’t it? The issue is that as long as language is used as a stick, a marker, a means of ownership then there will be problems. Which is to say that there will almost always be problems if a zero sum game is played on such matters. By this stage, it would have been pleasant if the DUP and Sinn Féin had agreed to ignore the other’s usage, if they could not bring themselves to use both. That’s difficult, particularly after a shared history like that in the North, but it is essential. But it is subtly different to the old phrase ‘parity of esteem’. It’s not so much the latter as an evasion. And in that respect it is analogous to actual physical spaces within the North which are confined to individual communities. In that regard it could be seen as profoundly negative, as if when charted on a venn diagram there are no intersections between neighbouring circles (and this is hardly a novel analysis – after all Eamonn McCann has made something of a career of criticising the GFA on precisely the grounds that it institutionalises such dynamics… although my only thought would be that since they pre-exist it is difficult to unpick that particular chain of causality or indeed to divine a replacement). And of course it is how that applies in the public sphere that is more problematic again. And then layer on top of that the Irish language and we can see scope for further difficulties. But it is crucial that they are addressed in an equitable fashion and one which doesn’t seek to deny expression to any group. In a way the South has had to wrestle with a similar issue which at first sight seems easier but in practice has been arguably as difficult, not least due to the old problem of paying lip service to an issue. The nominal bilingualism of the state has leant Irish a spurious status in the public space. There, but for many ignored. A small anecdote. Some years ago I was at a conference on issues relating to language and the point was made that now Ireland had a significant influx of people from abroad this would lead to the necessity to ensure that signage and suchlike accommodated other languages. The discussion went back and forth about how difficult this might be. Imagine the practical problems of having more than one language in the public space? Eventually I raised a hand and hesitantly pointed out that we already lived in a bilingual state and therefore this might be a quantitative, but not a qualitative change. So blindness exists on all sides and the solution – if that’s even valid as a term in the context of this debate – is difficult to discern clearly. One might cynically argue that if we take the Southern route then chances are that the less dominant language will fade from public view almost simultaneous to its position in the public view. However, it’s not difficult to propose that that is far from the outcome that Allister would find optimal (or ironically, many many of us). And for him it’s not just about a nominal equality of expression but about the expression itself in the public space. On this blog it is easy to use the terms more or less interchangeably simply because it is easy and it allows for a recognition that there are reasonably distinct cultural and political identities on this island and that by using all available terminologies one diminishes none of them. It is that very plurality of expression which is offensive to Allister. Now, we could take the line that he is a marginal and diminished force, although time will tell. But it may well be that – in this instance – the best route is to ignore him and the viewpoint he represents and seek a sort of parity between such expressions at state, or sub-state, level. And it may be that, pragmatically speaking if one hopes for stability, that is the only route in the society anyhow – a messy incomplete and stuttering advance that slowly allows cultural and socio-political expressions their space in the sun. Same as it always was. Posted by joemomma in Labour Party, Media and Journalism. Now I’m an adult and I know that cordial greeting does go on in this country, even amongst our political classes, but it is really necessary to have it thrust in our faces on the front page of our paper of record? I’m happy enough for such matters to be discreetly reported on the inside pages, but bear in mind that children will have seen this on the news stands.